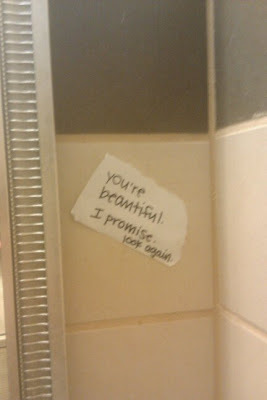 It was posted beside the mirror in the women's restroom. I didn't know at the time that there was a "name" for this, but I knew that I was touched enough by it to snap a quick pic of it with my cell phone. Then some time last week a friend of mine on Twitter tweeted about something called Operation Beautiful. And then it dawned on me that the post-it note I had seen in the bathroom over a year ago had to be part of that! 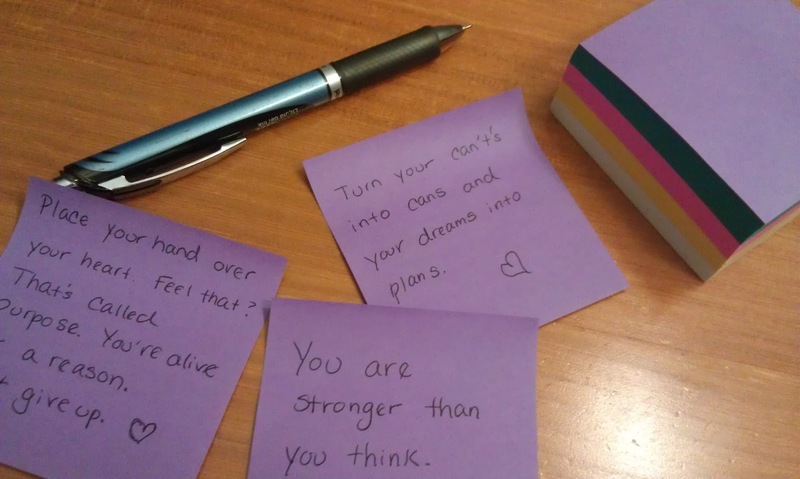 The mission of Operation Beautiful is to help end negative self-talk, especially with young girls and women. To learn more about Operation Beautiful, click here. I LOVE THIS IDEA! Where are you thinking about posting them? Great idea! Each one will be seen by people who need to hear the message you're putting out there. I'm going to read about Operation Beautiful now. Sounds inspiring! Oh, that is amazing. I want to join in now! how amazing of a mission! you are gorgeous! I love love love this idea. When I was part of Scentsy, we all did something similar. Trust me, when someone sees something like this on a post it, it will definitely touch their heart. I've heard of this before. What an amazing blessing. I should participate too - I don't know how much it will actually effect the people who see it, but I can't hurt - right?! You all are going to LOVE my update on this post. Be looking for it tomorrow morning. :) It is pretty cool!